We’ve still got sugar pumpkins leftover from our fall harvest and I wanted to use some up so I could make something sweet. I made a big batch of puree (freezing some of the leftovers) and whipped up these muffins. These are a great morning treat and packed with hearty nutrients to keep you going all morning long. They pair well with a cup of coffee (or tea) and are best eaten warm out of the oven with a smear of good quality butter. With that being said, they’re pretty darn great at room temperature too. Sweetened with maple syrup and overflowing with warming spices these are the perfect wintertime treat. I hope you all enjoy them as much as we do. Pour a cup of coffee, grab your spatula and get baking! Preheat the oven to 400F. Lightly grease a standard size muffin tin with oil or cooking spry and set aside. In a large bowl whisk together the oat bran, flour, baking powder, spices and salt. In a separate bowl whisk together the eggs, pumpkin, milk, maple syrup, vanilla and oil. Pour the wet ingredients into the bowl with the dry ingredients and stir until just incorporated. Spoon the mixture into the prepared muffin tin and bake in the oven until a toothpick comes out clean when inserted in the middle of a muffin, about 18-22 minutes. Let the muffins cool for about 5 minutes in the pan before gently removing them to finish cooling on a wire rack. *Store muffins in an airtight container on the counter for 3 days or place in freezer bags and freeze for up to 3 months. *You can make pumpkin puree by roasting a whole pumpkin in the oven until tender. Remove the seeds and stringy flesh before transferring the smooth flesh to a food processor or blender and pureeing until smooth. Thank you for the ingredient substitutions included in the ingredient list. Eliminates the “gee I wonder if I could use something else instead” dilemma & gets me in front of the stove faster. I’m slowly learning your swap outs though. Looking forward to trying these right now. Can’t wait to make these! Granddaughter is Vegan, so will use egg substitute and almond milk OR coconut milk. Made these this morning before shoveling snow off the roof! Delicious fuel for Snowmageddon in the Gorge! Thank you! I subbed wheat germ for oat bran, subbed honey for maple syrup, forgot the milk, and added Zante currants because I love them. They turned out great. I think my pumpkin was pretty liquid-y after I added water to make it blend. Thank you for all your wonderful recipes, Andrea! You inspired me to roast one of the sugar pumpkins that had been starting at me all season from the window sill. One pumpkin will yield enough for one batch of muffins, pumpkin soup or risotto for dinner, and a frozen jar of puree for another recipe on another day. Yahoo! I have made these twice now with my youngest son (9) and my kids love them. 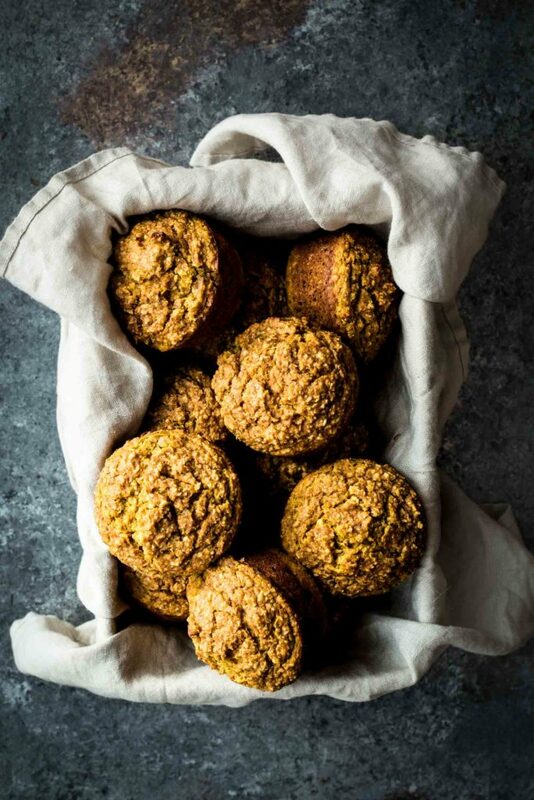 It’s hard for them to eat on cold dark mornings before school and these muffins do the trick. We made them in mini-muffin pans and used our olive oil because we are out of nut/grapseed oil. The whole house smells amazing! I can’t wait to try one at breakfast. I subbed wheat bran to skip a trip to the store. yay! Can’t wait for you to enjoy them for breakfast! what bran is a perfect substitute. Enjoy!